We bet your onlookers wouldn’t be able to keep your eyes off these gorgeous garba dress ideas! It is a lovely time, when there is a festive mood around and dance is in the air. 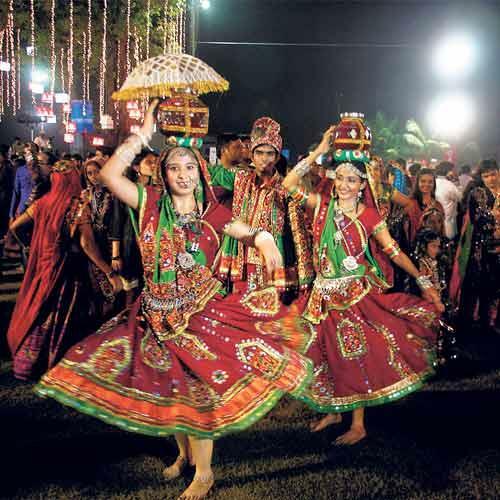 Garba for sure over the Navratri nights would be a time when PYTs doll up to the hilt, and spare no fashion statement to make their appearance divaish like. They may opt for the simple chaniya choli or the lehenga choli, or may just emulate Bollywood divas in garba ensembles for the evening out. If you are confused, we have for you a range of gorgeous garba ensembles to choose from. Take a look! 1. If minimalism is your thing: A gorgeous full-sleeved cropped choli in red with ethnic embroidery on it, along with a long flowing lehenga skirt with borders done on traditional motifs, the creamy-red ensemble would be a gorgeous yet minimalistically designed garba ensemble to flaunt. 2. Floral touches all the way: In tones cool to warm, a garba ensemble sans the use of floral motifs is incomplete we say. With midnight blue as its base, the cool toned purple and warm toned orange floral touches makes for a tantalizing design on the contemporary garba ensemble. Cropped top in velvet and the lehenga in the same fabric, is blessed beautifully with a chanderi odhni. 3. Play with layers: For women that have a little more to flaunt; body frame wise- the layers on a garba ensemble would and in an empire waist netted choli embellished with embroidery does justice. A fashion statement to make, the layers play along to add more height and leanness to the body, whilst the cropped choli embossed with net and lace drapes the body, making it look asymmetrical. 4. Classy touches on silks: Silk and satin would be the favorite this year amongst the garba dancers, which is why designers have worked on the same. In classy whites to creams and off-whites, bestowed with warm toned shades on the lines of mustards and orange; neutral browns and dark shades of black seem to make its way into every closet. Golden thread work and embroidery works its magic too. 5. New age geometric designs: Bestowed on fabrics such as cotton and velvet, the new-age garba designs are ensembles that have a traditional touch with the cut, but with a twist of geometric shapes and designs. Cropped velvet cholis in solid dark hues, paired along with warm toned cool pinks and with large geometric shapes in dark colors for the border are chic statements being brought forth. 6. A splash of colors: To make an eye-catching powerful statement at the garba dance festival, reign the night and own it with a splash of colors we say. 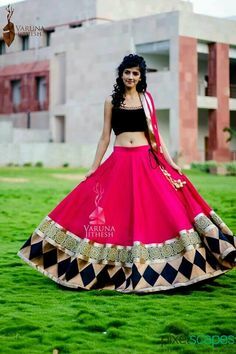 While the cropped choli is bestowed with plenty of embroidery and embellishments galore, the lehenga skirt all too flowy is washed in pretty vibrant warm toned shades that bring a very youthful and vibrant balance to the overall appeal. 7. Simple is beautiful too: Keeping it simple and a no-fuss, the beautiful matte toned orange garba number here is a classy ensemble for the plain Jane that loves no fuss. 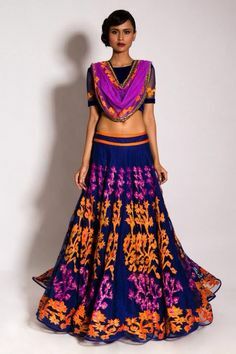 Embellishments mostly seen on the border of the skirt and the cropped choli, the contrasting blue odhni is a perfect color match to make the outfit up the ante with a fashionable touch.